The first day of school is quickly approaching. It is always such a bittersweet day. Watching our kids grow up and enter another grade is HARD. But….having them home all summer does kind of make seeing them go back to school nice, LOL. Taking special pictures on the first day of school is a tradition many families have. I have rounded up some of the best first day of school photo ideas to make your memories even sweeter. You can use the first day of school DIY resusable chalkboard year after year over at Make It Love It. 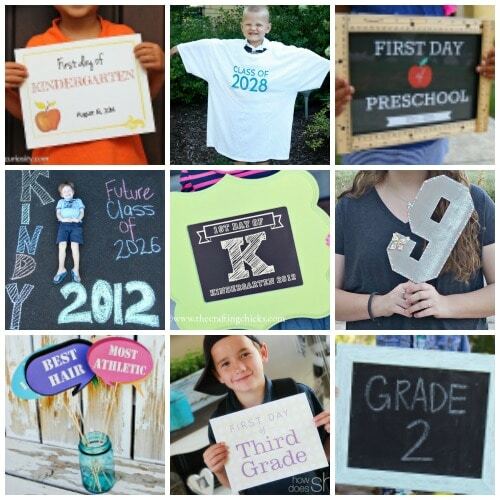 The first day of school number props are great for personalizing here at Life is Sweeter by Design. The DIY Ruler Signs are super cute over at Honey and Lime. 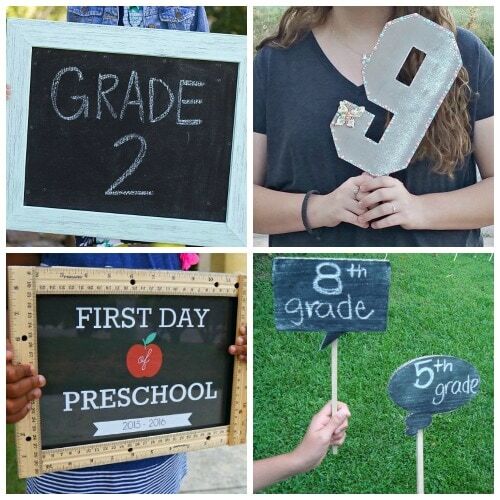 I absolutely love One Artsy Mama's idea for first day of school photo booth props. I love the keepsake t-shirt idea over at That's What She Said. Making chalkboard t-shirts is the perfect way to document the first day of school thanks to the Crafting Chicks. 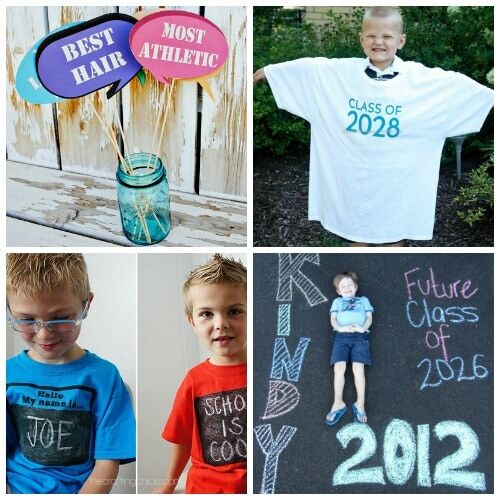 Paging Fun Mums uses sidewalk chalk to create adorable 1st day of school photos. 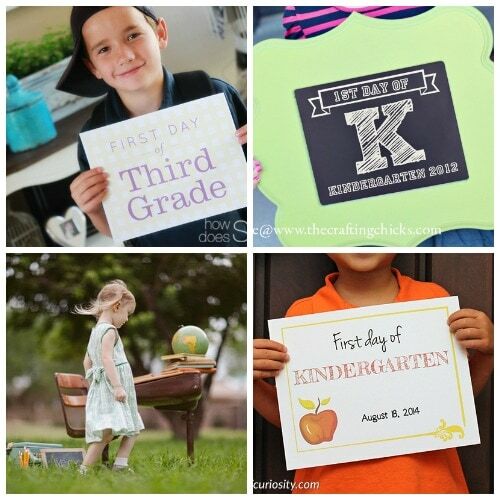 How Does She has some cute free printable signs for the 1st day of school. The Crafting Chicks have some cute ideas for you to use their free printable signs for back to school. Somewhat Simple has some really sweet ideas on taking back to school pictures. Gift of Curiosity has some adorable first day of school printables with apples on them. If your child rides the school bus then the printable signs from The Chirping Moms will be great! These colorful printable signs will be so precious from Ink Happi. 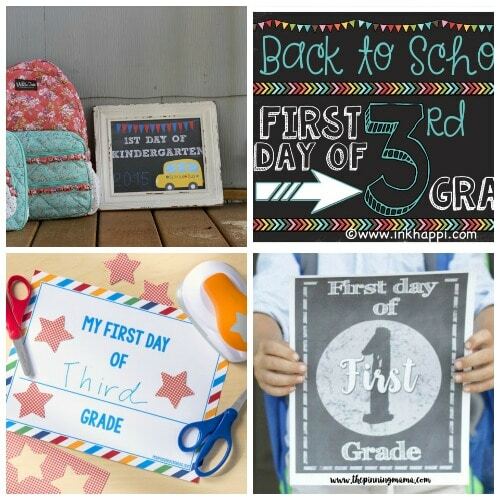 Mod Podge Rocks has a cute first day of school printable that you can customize for each child. The cute printable signs over at The Pinning Mama will create great photo memories. How Do You Document the First Day of School? What are your favorite first day of school photo ideas? Do you prefer something you can reuse every year or do you like to change it up from year to year? I would love to see some of your first day of school pictures! !